Hauskaa maailman korttiaskartelupäivää. Tervetuloa Allsorts haasteen pariin! Tällä viikolla olen emäntänä ja aiheeni on "lehdet ja puut". Käytin jälleen Penny Blackin upeaa järvimaisema- leimasinta, nyt syksynväreissä. Hi; Happy World Cardmaking Day, it's time for a new Allsorts Challenge! I'm hosting this week with a theme "Trees and leaves". Welcome to join us. Our sponsor is Marianne Design. This must be my favourite stamp, you've seen this lately, but now in a bit of different colours. Colouring with Distress Inks and water in WeR Precision Press and final touch with brushes. Beautifully created landscape. 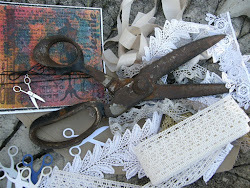 Thanks for joining the Crafting With An Attitude challenge. Wow, what amazing autumn scene! Love what you've created here. Another stunning card Mervi. Thanks for the fabulous challenge! Lovely creation, thank you for joining our challenge at CRAFT Challenge this week. Please also have a look at our DT call and consider applying for the position of DT member, we are a friendly bunch. Oh wow--this is stunning! Love all the white layers, too! 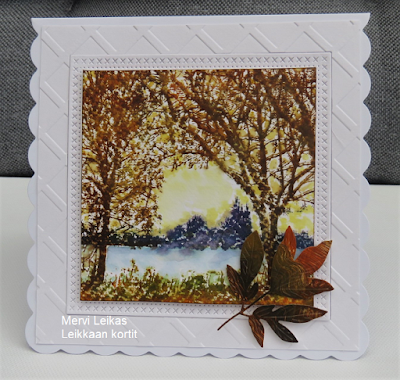 Great landscape card, beautifully done, good luck and thanks for entering Creative Knockouts. Absolutely stunning coloring. Beautiful scene.